Uttarakhand is often referred to as Devbhumi or the Land of the Gods and is known for its scenic beauty and breathtaking landscapes. A Google search for Uttarakhand today, however, throws open images and videos of flash floods, falling mountains and people and property being washed away. Uttarakhand faced flash floods back in 2013 which became a national concern as it was the most petrifying disaster after the Tsunami of 2004. That disaster, it seems, was just a starting point. Ever since then, we hear news of devastations like landslides, buildings collapsing, floods etc. caused due to rains during the monsoon season. 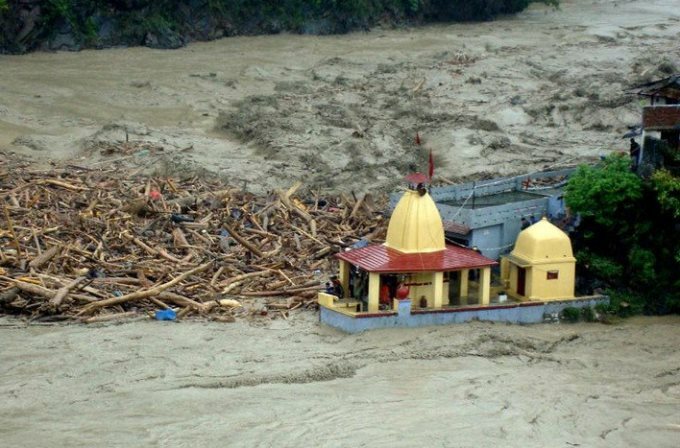 This year, yet again, the monsoon is bringing news of devastation across Uttrakhand. In Dehradun, the State capital, the onset of the monsoon witnessed the loss of 7 precious lives which were lost due to heavy rain. This has become an annual phenomenon and we see tremendous damage to the environment, human lives and property each passing year. At this rate, will Uttarakhand remain the pious Land of the Gods that it once was? Located in the lap of the Himalayas, Uttarakhand is a beautiful State with ancient temples and religious relics. Every year, large number of people visit here for praying, for the Char Dham Yatra, spiritual awakening, vacations, extreme sports, etc. With increasing number of people visiting Uttarakhand and due to the ever-growing human needs, Uttarakhand is rapidly “developing”. Its tourism industry is also making various attempts to attract more and more tourists. It needs to be noted here that at present, the tourism industry is the major contributors to the State’s economy. However, the deteriorating environment of the State has now become a concern for people, tourists as well as the Government. Back in 2012, the Central Government had declared a 100 km stretch, from Gaumukh to Uttarkashi, as an Eco-Sensitive Zone (ESZ). It was done without any consultation with the State Government and was an attempt to prevent ecological damage caused due to developmental activities in this fragile ecosystem. The declaration of the ESZ meant that there could be no big business in this area and all developmental activities are regulated. This announcement was immediately followed by a series of protests from the local people. The argument was that the ESZ was preventing the development of the region especially since life in the mountains is already very difficult. Even the Uttarakhand State Government opposed this decision. After the 2013 floods, the Central Government’s notification started making sense to the people. The choice became clear to them, it was either “development” or Survival. The damage caused by the 2013 floods was real. Thousands of lives were ruined and villages were completely destroyed. Various attempts were made to restore the environment and bring life back on track. It was, in fact, the greatest warning that Nature could give, a warning that we missed. And since we missed this warning, it became instead, the starting point of a series of devastation. Post 2013 Floods – Recovery or Repetition? Shortly after the Flash floods of 2013, in order to kick-start the tourism industry once again, the Uttarakhand State Government worked actively to come up with various plans. The Winterline Festival in Mussoorie was one such initiative. The Tourism Department of the Government of Uttarakhand flooded television and other media outlets with more and more advertisements. Things got even more stirred up after the announcement made by Hon’ble Prime Minister Narendra Modi of the All-Weather Road Project in Uttarakhand. This road was to pass through the ESZ and as a result some relaxations were made allowing for construction work within the ESZ. This agitated the local people and gave them reasons to expand tourism activity as well as other industries in and around the ESZ. The All-Weather Road is aimed at making the Char Dham Yatra easier and thereby inviting more tourists in Uttarakhand. It is an undeniable fact that this project and the Government’s development policy for the State are focused towards supporting the tourism industry. With increasing flow of tourists, there will be a need for more places to stay and more and more of construction activities will take place. The question here is that this development will come at what cost? At the cost of environment? Or at the cost of inviting more and more disasters, the likes of which Uttarakhand is witnessing today? What we have seen is that all “developmental activities” in Uttarakhand are coming at a huge cost to the environment and to local people. It is like a path taken in a state of oblivion towards self-destruction. The developmental plans in Uttarakhand are fancy and promising but evidently, none of them have been evaluated in the longer run. Since the developmental activities are unplanned and lack vision, a small blow causes huge devastation. It is true that development is very important and people of Uttarakhand must not be kept away from it. New opportunities, better lifestyle, more education is desirable for all people in India. However, does development have any meaning if more cars, big houses are followed by flash floods and falling mountains? We need to understand that Uttarakhand is a special and sensitive place. It is time we need to stop blaming and thinking of who and what has gone wrong. We also need to question as to what kind of development do we really want. Any developmental activity in Uttarakhand needs careful planning, more caution and must be done after giving due consideration to the local environment. Any Land of the Gods is supposed to be safe, peaceful, beautiful, natural and calm. In reality, the exact opposite is happening. We need to preserve the very essence of Uttarakhand for future generations and for our own survival. A clear balance between development and safe environment is ecotourism. The State Government should ensure that all tourism is ecotourism and spread awareness and sensitivity in everyone, especially those linked with the tourism industry. Nature has a lot to give to us if we do not harm it and a lot to take away if we decide otherwise. Uttarakhand is free to choose – a trade-off between development and survival or development with environmental planning.